National Instruments has introduced the C Series NI 9861 CAN interface and NI 9866 LIN interface, the newest modules in the NI-XNET family of products and the first low-speed CAN and LIN modules that integrate with the entire NI CompactDAQ platform. As part of the NI-XNET family, the new modules provide engineers with productivity advantages such as hardware-accelerated messaging and onboard processing. The single-port, low-speed C Series NI 9861 CAN interface module features integrated CAN database support for importing, editing and using signals from FIBEX, .DBC and .NCD files. It is capable of 100 percent bus load communication up to 125 kbit/s without dropping any frames. The NI 9866 LIN module is also a single-port interface with integrated support for importing and using signals from LDF databases along with master/slave support and hardware-timed scheduling for master tasks. It is capable of 100 percent bus load communication up to 20 kbit/s without dropping any frames. Engineers can use the new CAN and LIN modules with the same NI LabVIEW or ANSI C/C++ software code on a variety of platforms including NI CompactDAQ, CompactRIO, PXI and PCI. Project reuse saves time as the same applications can be used, for example, in labs with PCI; in manufacturing end-of-line tests with PXI; in portable in-vehicle communication settings with NI CompactDAQ; and in headless in-vehicle logging with CompactRIO. With native support in NI VeriStand real-time test development software, the new modules are ideal for real-time automotive testing applications, including hardware-in-the-loop simulation and test cell applications. 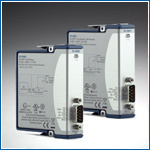 Both modules support synchronization and triggering with other CompactRIO and NI CompactDAQ modules. NI CompactDAQ offers a platform for portable in-vehicle network communication, in-vehicle logging and basic automotive electronics communication in a USB, Wi-Fi or Ethernet form factor. The NI-XNET family provides a common programming interface for multiple automotive networks such as CAN, LIN and FlexRay. With NI-XNET interfaces, engineers can develop applications for prototyping, simulating and testing these networks faster and more easily in LabVIEW and LabVIEW Real-Time software as well as ANSI C/C++. The interfaces combine the performance and flexibility of low-level microcontroller interfaces with the speed and power of Windows and LabVIEW Real-Time OS development. Engineers can easily integrate them with desktop real-time PCs and real-time PXI systems. Readers can learn more about NI CAN products by visiting www.ni.com/can and NI LIN products by visiting www.ni.com/lin. National Instruments (www.ni.com) is transforming the way engineers and scientists design, prototype and deploy systems for measurement, automation and embedded applications. NI empowers customers with off-the-shelf software such as NI LabVIEW and modular cost-effective hardware, and sells to a broad base of more than 30,000 different companies worldwide, with its largest customer representing approximately 4 percent of revenue in 2010 and no one industry representing more than 15 percent of revenue. Headquartered in Austin, Texas, NI has approximately 6,100 employees and direct operations in more than 40 countries. For the past 12 years, FORTUNE magazine has named NI one of the 100 best companies to work for in America.